Google has launched the first member of its Home family with a screen attached. It means that with the Google Assistant built-in, you can use your voice to get the best of Google - Search, YouTube, Google Photos, Calendar, Maps and more – on the built-in display. The Google Home Hub is based around a 7-inch touch screen and can do all the usual hub smart speaker type tasks as well as the new visually enhanced ones outlined above. The display is backed by a “crystal clear speaker” and the attractive design with fabric base and rounded corner display is available in Chalk, Charcoal, Aqua and Sand finishes. On the topic of audio the built-in speaker is said to be ‘full range’ and offers 80 dB SPL @ 1KHz, @ 1m. For voice commands the device has a 2 mic array. The Google Home Hub connects to your home network and other devices by 802.11b/g/n/ac (2.4GHz/5GHz) Wi-Fi. It supports BT 5.0 too. As part of your home network it is expected that you will monitor and control things like the Nest range of smart home devices, thermostats, security cameras, and lighting products via Home Hub. A particular strength of the Google Home Hub is its YouTube handling, especially since Google has purposely hobbled the Amazon Echo Show’s handing of this app. 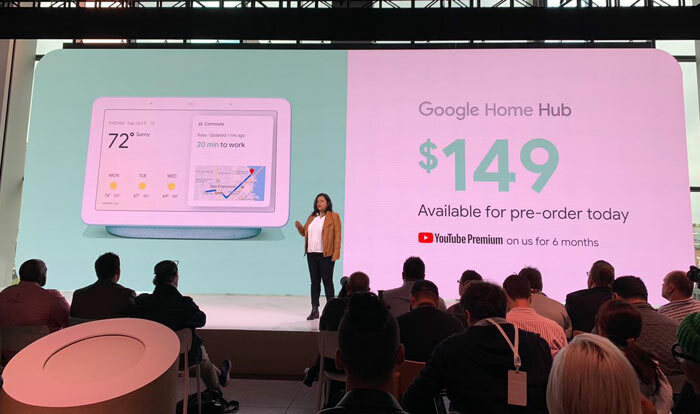 Google Home Hub costs $149/£139 and comes with 6 months of YouTube Premium. It is available to pre-order and will ship from 22nd October. The Chromecast HDMI TV streaming accessory device was first launched back in 2013. Yesterday Google launched an enhanced version with new colour choice (chalk/charcoal), and a faster processor. Specifically, Google says the new version delivers a 15 per cent improvement in performance which helps smooth streaming at 1080p 60 frames per second. Despite the enhancements Chromecast is still $35/£30 and available now. Here in the UK it is often available in offers from third parties and there could be stock of the older model to clear at knock down prices if you are interested. If I can manage a life without any kind of hub or IoT device listening in on my home, especially one which costs *me* to keep, I will be happy. Amazing how convenience costs so much, in so many ways. Also, “commends” ln14 rather than commands. I think it would sell more if it was named “Ispyonyou”. While I like the idea of a centralised calendar/weather station/music streamer etc I'm not sure I would want one from Google or facebook, even though I use an android phone. 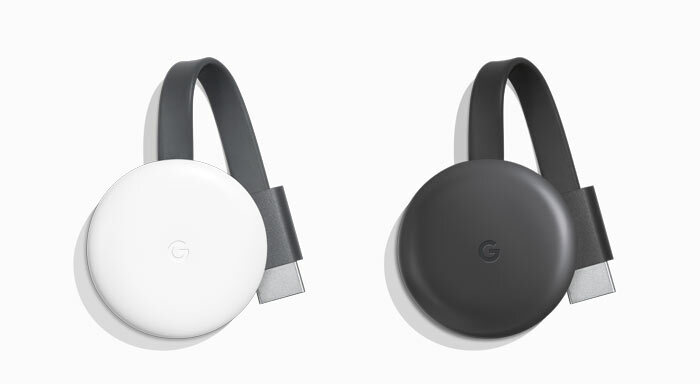 Having said that, all the current designs (from facebook/google etc) literally look like the designers have taken a tablet and superglued it to a stand with a speaker built in….the borders on the google one are huge and there's no reason for them. I remember once upon a time where you could buy docking ‘stations’ for your tablets (I still have one with my Asus nexus 7 and that has a socket for a speaker output) and android had a ‘docking mode’ feature. I honestly feel that something similar to that would be far more practical than a superglued ‘tablet’ on a speaker with limited functionality. Tablet can be used anywhere you want rather than being restricted to one location, while it's detached the dock turns into a ‘home/mini speaker’ and when you dock the tablet for charging etc it it turns into ‘home hub’. So this thing isn't a router, like the BT Home Hub, then? It's just a tablet on a stand that does things already done by my existing TV, PC, tablet, phone and so on?